If your great-grandparents lived through a famine, their experience could well have altered their genetic code. And three generations later you could well be showing signs of that change. The idea that our environment and lifestyle can alter how our genes behave is part of the new field of science called epigenetics. It has been described as a revolution in the way we think about the human blueprint but has also been controversial – not least because it sits awkwardly beside Darwinian dogma. Epigenetics comes from the Greek term “epi” meaning on or around the gene. In simple terms it’s a mechanism that describes how genes can be switched on or off by chemical signals, a bit like a dimmer switch on a light, without altering the DNA structure. These signals can alter the way genes produce proteins or signal other genes and importantly, they can last months or years and are potentially reversible. These epigenetic switches are triggered by many factors such as our lifestyle, environment and our age, and as the development of a growing foetus in the womb is totally dependent on these signals, it can alter the function of its cells. This can come in many forms and shows just how important these finely controlled mechanisms are for normal life. The one most easily studied is methylation, in which a methyl chemical group is added or removed from the DNA, which alters what it does. Other changes include how DNA strands are folded tightly or loosely around chromatin, a mass of genetic material that makes up the content of the nucleus of a cell. Of great current interest – and controversy – is the idea that these signals can be triggered by an event in one generation and passed on to three subsequent generations by a slightly altered gene function, even if they were not exposed to the initial trigger. Until about three years ago, we believed that (unlike plants) each time a human egg and sperm met the previous epigenetic marks were wiped clean – a bit like reformatting a CD. However, we now know that some signals from our parents escape the wiping process and are retained in the next generation. What is controversial is how important these signals are in humans. Many studies of rodents and other animals have shown that effects of diet, stress, emotional deprivation or hormones in the grandparents generation can influence the traits and characteristics of grandchildren and great-grandchildren – even if they never met their ancestors and were never exposed to the initial event or diet. These changes in physical characteristics have been shown to be due to epigenetic changes that are passed across the generations – one example is how tortoiseshell cats get their markings. For me, the finding that all animals that have been studied have these generational changes tells me that humans are unlikely to be different. In humans the data is less clear-cut – it isn’t very easy (or ethical) to keep humans in cages and decide who they mate with. So one way that scientists hope to get closer is to look at historical famines, although this can’t be as definitive as a lab test. The first example is the Dutch Hunger winter of 1944-45 where a quarter of the Netherlands was starving for three months. Women who were pregnant then produced smaller children more prone to diabetes and schizophrenia – traits which were also more common in their grandchildren. Devastating impact of famine but also for generations down the line? 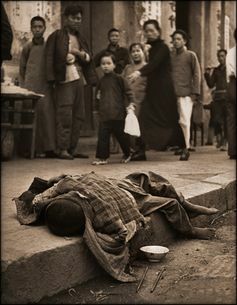 Similar results came from a study of the Chinese famines of the 1950s. And in Overkalix, in remote Northern Sweden, the effects of good and bad harvests on adolescent boys had opposite effects on cardiac risk in their grandchildren. An ongoing longitudinal study in Bristol that has followed thousands of young people and their parents, there is evidence that boys whose grandfathers smoked early in life had greater levels of obesity. All these studies have their flaws and the numbers of them are generally low. But they do show a consistent effect in humans. They suggest that at least some of the current unexplained epidemics in common diseases we are facing could have their root cause two generations previously when more people started smoking and lifestyles began changing. Critics dismiss the importance of epigenetics on diseases and personalities in humans. But having studied identical twins for 20 years I know that just because you have the same DNA and genes in every cell of your body (identical twins are essentially clones) doesn’t make you the same person. Most common diseases, although highly genetic, are not shared by identical twins, who only develop the same disease in 20-30% of cases. And they rarely die of the same disease. The reason for this disparity is the epigenetic differences between them. Epigenetics is now being used to classify cancers and decide which treatments are most effective – and there are now some early diagnostic tests for cancer. The number of epigenetic drugs being used for rare blood cancers and leukaemias is growing and increasingly other cancers. One of these, Decitabine, is thought to work by reactivating tumour surpressor genes that have been switched off by the DNA methylation process. So epigenetics is clearly important in humans and not just an epiphenomenon. We need to continue to understand how exactly it affects us and potentially how our environment and behaviour now could affect our grand-children in the future.